As it happens, I just learned today that the evolution of some of Marty’s recent work will culminate (according to the pro-abortion site rewirenews.com) in the book’s publication today! Here’s the origins story. she turned it into a HuffPost article, and then a book proposal, and then a book. 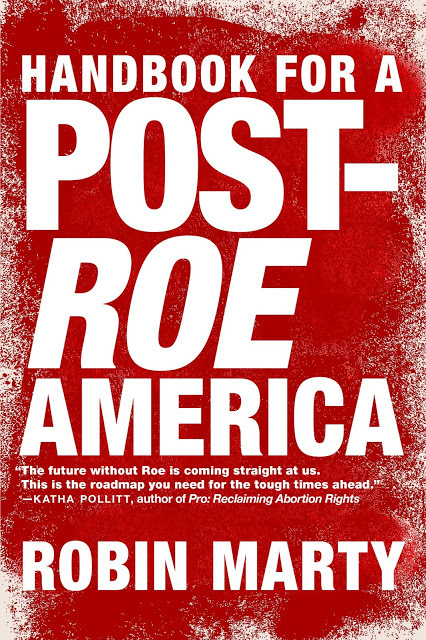 After a breakneck round of drafting and editing, Handbook for a Post-Roe America will be available January 15. Marty’s TIME magazine op-ed is timeless, so to speak. Roe doesn’t have to be overturned for her advice to be taken, although, granted, it begs to be ridiculed. Just as you would have automatic deductions taken out of your paycheck to pay for (fill in the blank) or just for a rainy day, you could do likewise for a different kind of future unexpected turn of events: becoming unexpectedly pregnant. You never know how seriously pro-abortionists take their own end of the world [Roe] as we know it rhetoric. Typically, they are really grousing about state legislation which is commonsensical (except to the Abortion Industry), and in close harmony with the public’s view—for example, they don’t want their tax dollars paying for elective abortions. But we can hope they are not only right in the Big Picture—the Fall of Roe—but that the legal monstrosity falls sooner rather than later.